Looking for spooky or ghoulish Halloween creature props? From aliens to demons, ghosts, vampires, werewolves, zombies, and more? Check out these scary Halloween effects! Ahh, the creatures from the shadowy depths of hell. These are one of the best things about building a cryptic haunt. 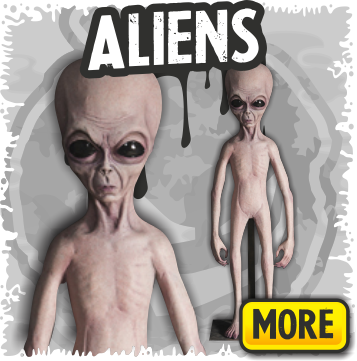 Here at Halloween FX our foam and latex creatures are not just scary, they are out-of-this-world grotesque! We create lifelike creature props with all the evil, insidious, care needed to bring screeches to your unsuspecting guests. You are sure to use our creatures year after year, to bring that menacing feel to all your Halloween decor. Using our creature props can turn a normal, mundane, haunted house into a catacomb of twisted horror. We guarantee that our horrific creature props will not only scare your unsuspecting guests but will reduce them to quivering mindless fools. We take great care to make sure our unique creature props are as real and unsettling as they can be. We also have all your favorite Halloween props, like skeletons, zombies and clowns. In fact, anything your imagination can think of – and then some. We use the most innovative materials to bring our Halloween creature props to life. Enjoy the most petrifying realism you have ever seen. If you want professional, movie-quality props, then you came to the right place. All of our Halloween characters are amazing. Classics like reapers, vampires, werewolves, ghouls, haunted servants and knights, and even some killer clowns are represented here. We have props crawling from the ground, popping out of boxes and hanging overhead. No matter the type of beastly prop you need – we've got it. If you are really into movies and TV, we have some insanely realistic Halloween characters for you too. We have the killer Jason Voorhees, knife slaying Michael Myers, the unnatural Borg Queen, force-wielding Yoda, and the all time favorite psychotic, flesh-ripping Pinhead. Once you have seen one, we know you are going to want all of our blood-curdling Halloween characters. Sometimes you need a full sized body to decorate with your gruesome butchery. We sell life sized mannequins that can help you do just that. 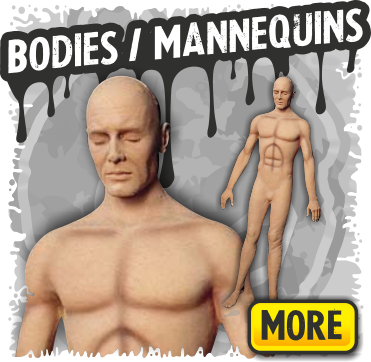 Our mannequins can be tortured, twisted, blood soaked and even decapitated to fulfill your evil and vicious designs. We even have autopsy mannequins! We have all sorts of hideous looking mannequin props. Check out our tortured torso man being gnawed at by flesh-eating rats, or maybe our ripped apart victim with his guts spilling to the floor is more suited to your macabre personality. You can find all types of disgusting and gnarly mannequins in our array of our Halloween creatures. 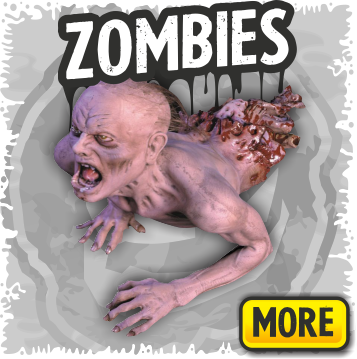 Add that cannibalistic quality to your haunt with timeless zombie decorations. Our oozing, blood soaked zombie decorations are so grotesque, even you will want to pick up one of our flamethrowers and incinerate them. Our zombie decorations are top of the line, with their decaying, dripping flesh and mindless desire to tear apart body parts. When you put any of our ripped apart, creeping zombie decorations in your Halloween haunt, you will leave your guests running for their lives.